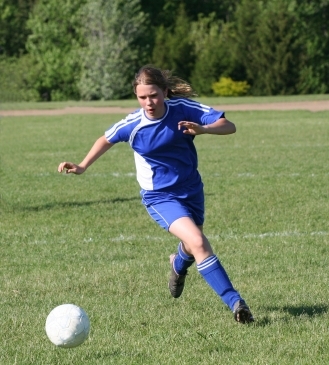 Speed in soccer is much more than just the ability to sprint. The simple talent to run quickly is an excellent weapon to have, but alone it’s not enough to get the job done. There are a lot of players who can cover ground very rapidly but who have problems starting, stopping, and changing direction. Good scoring situations are often lost through the inability to turn quickly. On the flip side, slow-turning defenders are often exploited by fast forwards. Most young players, such as under-10 down to kindergarten and pee wee age, don’t have speed but can start to develop good turning skills. Being quicker on the turn can be improved through constant practice. Even players that aren’t naturally fast can become very good at being good turners. Here are some aggressive soccer drills to show your players how to become more skilled at turning both defensively and offensively. 1) Begin by standing with your back to a line 6 to 8 yards behind you. On a signal turn, get to the line as quickly as possible. Practice turning both ways because in a game you’ll never know which way you’ll have to turn. 2) Now enlist the aid of a teammate. He runs towards you and when he is about two yards away from you he makes a break. The object here is for you to turn to whichever side he has gone past you and try to catch him. Change roles after every sprint. You will quickly learn that by approaching the oncoming player at an angle you can be on the half-turn before he makes his break. This type of practice will put you in a good position when you are approached by an attacker in possession of the ball. You can guide him into an area away from the goal so that you are on the half-turn ready to make a tackle if he makes an error or to turn quickly to challenge should he go by. Remember, you must be very careful here not to commit yourself unnecessarily and make it easy for him to go past. Attackers must also be quick to turn. There are 2 ways to do it – one involving turning the back towards a defender and the other involving going right at him. 1) As a forward you are always attempting to lose your marker. This is a vital part of offensive play, to turn defenders. They do not like to be turned around and made to run back towards their own goal. Speed and surprise are the elements of success. Turning on offense is a little different and might require the skills of faking but it can be done. Go right at a defender and when close turn your back to him. At this point you can curl the ball around you or pass it back to mid-field help. 2) The technique of turning is important here. Many players turn away from the opponent taking the long way around. This can lead to a lot of wasted time. Try to cultivate the turn into the defender. This means that you are really attacking him and also that you are not turning your back on the oppo­nent or the ball. Unpredictability in play is essential in soccer. If you lay the ball back every time you get it, your play will become predictable. Learn to vary your play so that you keep opponents guessing. Turning on the ball means taking a chance of losing it. Give your players that ok that it’s fine to try and be creative in the right place and time. Make sure that your techniques and that the odds favor you. Be quick and you may well take your opponent by surprise.